Factors such as urbanization, population aging, market access and economic growth are driving more and more patients to the healthcare system. As a result, pharmaceutical companies have the opportunity to launch branded copies or generics across multiple countries and thus increase the size of their portfolios. With the increased size of portfolios and the growing number of launches in the typical portfolio in emerging markets, we developed a methodology that combines smart analytics and human direction. The L.E.K. 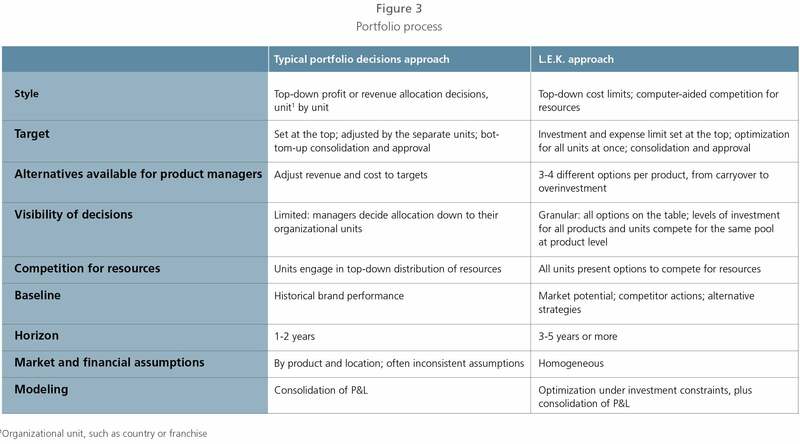 large portfolio method consists of four steps: data preparation, building consistent projections in alternative investment levels, defining restrictions and optimization. Companies can leverage local resources already deployed across countries and therapy areas (TAs) using synergies to launch an increasing number of brands. As Figure 1 shows, pharmaceutical companies have a large number of brands beyond their global portfolios. Notably, Merck and Eli Lilly have stayed focused on the core global brands, while companies such as Sanofi are building local brands to a greater extent. Global companies such as Abbott and Pfizer, and locals such as Aché and Eurofarma (Brazil), Silanes and Sanfer (Mexico), Bagó and Roemmers (Argentina), CCM (Malaysia), Kalbe Farma (Indonesia), Unilab (Philippines), and Hengrui (China) have significant portfolios in multiple TAs. The same effect is spreading into the specialty care area (Libbs in Brazil, Celltrion in Korea, Fosun in China), with biosimilars proving relevant in portfolio decisions. 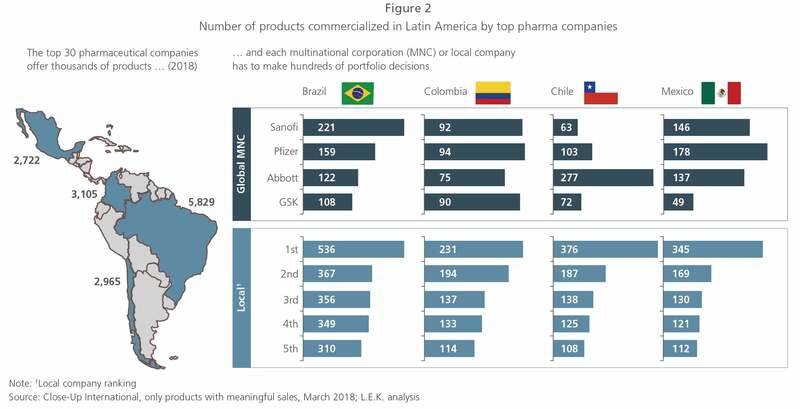 Figure 2 illustrates how the leading pharmaceutical companies are offering thousands of products in Latin America, for example. In China, many large domestic pharmaceutical companies are faced with a complex, mature, generic portfolio of hundreds of products that need to be streamlined and optimized. It is not uncommon to see business development at the global, regional and country levels in emerging markets, in support of the growth resulting from portfolio enlargement. With hundreds of products, dozens of countries and multiple launches in the pipeline, the traditional budgeting process fails. It is challenging to cope with a one-country, multifranchise portfolio that requires promotion of more than 30 to 40 products spread across four to five sales teams, where hundreds of small decisions are driving today’s results and tomorrow’s growth. This is typically the case in emerging markets. Many funding decisions are being made based on decades-old budget processes designed for companies focusing on a few franchises and products. The typical process for allocating resources across a portfolio has not changed, following a combination of top-down target setting and bottom-up adjustment in the actual allocation of promotional and sales resources on the ground. With the portfolio sizes shown in Figure 2, resource allocation is a relevant challenge. Cross-country and cross-franchise decisions can be less rational than they appear. The top-down target-setting process, combined with some franchise guidelines, leaves a surprising number of decisions based on cognitive biases.1,2 Accumulated, these small decisions account for significant percentage points in operating margins. In a pharmaceutical market worth $270 billion3 in emerging markets, we believe there is anywhere between $8 billion and $14 billion in potential margin benefit across emerging markets simply by improving product-level resourcing decisions. The resource allocation problem has been addressed using multiple approaches: improving incentives to management, defining central guidelines, defining strategies (core products, growth products, tail products, mature lines, etc. ), and using frameworks and matrices. Process improvement also has been constantly addressed: establishing launch teams, using cross-functional approaches and embedding financial business partners in marketing teams, not to mention using approaches such as matrix organization, which secures franchise consistency. But the central concept remains surprisingly intact: Define a top-down target and a bottom-up review with a few interaction points. Hundreds of small decisions are made, trying to fit the existing “target” budget. Decisions are made for next year’s budget at the product level based on a one-year projection, and costs are added up. More often than not, the target adjustments are made at the product-manager level, where coordination and comparisons cannot be made. To make matters more complex, it is not uncommon to see cases where the basis for projection differs among managers. Different projections of currency, market sizes and competitor launches — are all present in the same country, from product manager to product manager. Can we do better than this since there are literally billions of shareholder resources at stake? With the increased size of portfolios and the growing number of launches in the typical portfolio in emerging markets, we developed a methodology (see sidebar) that uses analytics to support human decisions. The methodology amplifies the possibilities and allows choices that previously were considered unpractical. The combination of smart analytics and human direction has shown improvements from 3 to 5 percentage points in margins. Figure 3 outlines the key differences in our approach compared with the traditional method. The core of this process is transparency and competition for limited resources. The basic idea is that in the normal product planning phase, instead of analyzing the market to make one projection for one year, product managers consider what is already typical in most marketing plans in order to build two to four alternatives per product. We then let analytics determine the best product option, given that there are restrictions on funding. Let us take one example of the basic situation. Product 1: A product manager presents a mature product that is in a competitive market with multiple equivalent products, but it leads in share. He knows that there is a blockbuster launch coming in two years that will affect the present product’s market share. The product has significant volume and margins and is considered to be a core product. The market grows with the population at a certain age group. Meanwhile, in a different TA (potentially in another country), there is Product 2, which is in a very large market, but it has a small market share. Two core competitors are leaving the market to focus elsewhere and have not promoted their products for six months. Sales teams were let go or transferred to other franchises. There are no launches expected. Which product would you bet on? If you let the product managers make all the decisions based on the next-year expectation, they will probably want to increase resources to maximize margin but it is more likely, under the current processes, that managers will continue to invest in Product 1 rather than in Product 2. A discussion will ensue, eventually leading to a decision on where to direct the majority of the funding. Now let us imagine that for each of the two products you are in possession of two scenarios: high and low. You have the P&L projections (typical of marketing plans), based on unified and consistent assumptions of market sizes, population, currency and other variables. In other words, the projections are comparable. These projections are for five years, not just one. You can now compare the accumulated margins of the two products under the two possible levels of investment decision: high and low. In this simple portfolio, you can make a choice as to which level of investment for the two products will fit your available resources. Typically, with dozens of countries, hundreds of products and two to four scenarios for each product, we are discussing thousands of comparisons that are difficult to analyze. What can analytics and computers do? This is where analytics can help. Computers are better than humans at repetitive tasks. They are also better at the tedious work of making the hundreds of comparisons, estimates and calculations required to make decisions that eventually add up to a result. We can now rely on optimization techniques that will help us make choices that respect imposed restrictions — such as the overall budget and strategies such as investing at least 50% in selected markets — and can then review the final options as a team, using the analytics to support more informed decisions. Most of the work in a process involves creating transparency of decisions. We have found that products considered laggards are sometimes in fact underfunded opportunities that were left out because the overall strategy overlooked the opportunities. There are products that are doing well that could do even better if more resources were present. Sometimes there are products that are occupying space in the promotional grid but with few prospects. Product managers’ creativity is unleashed because instead of departing from one fixed position, they can, and must, imagine what they could do with more and can measure the potential impact of resource reduction. In practice, we make various adjustments to the optimization process to secure peer review of projections. 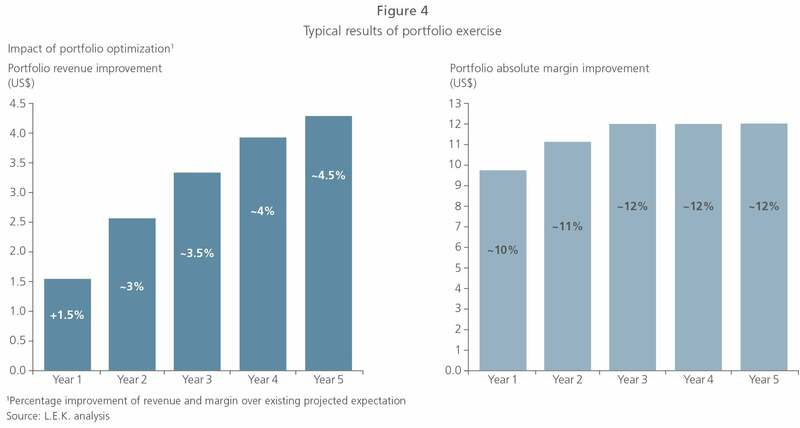 The entire exercise highlights the potential of an existing portfolio. The results of reallocation can be material, as shown in Figure 4. The process can be implemented in a pilot, where your company’s particular details will be adjusted to properly consider company strategy and limitations, and to prepare the organization. Although the process is straightforward, there will be a change in culture, and some initial effort will be required to put the model in place. Because of this cultural dimension, the commitment of top management is critical. With the increasing size of emerging market units and the importance of making decisions to sustain the best possible results from portfolio assets, it is worth the effort to invest in informed decisions about resources. 1Bazerman, M.H. and Moore, D.A. (2013). Judgment in Managerial Decision Making, 8th Edition, Hoboken, N.J., John Wiley & Sons Inc.
2Haselton, M.G., Nettle, D. and Andrews, P.W. (2005). “The evolution of cognitive bias.” In D.M. Buss (Ed. ), The Handbook of Evolutionary Psychology, Hoboken, N.J., John Wiley & Sons Inc., pp. 724-746. 3Estimate based on IQVIA Institute “2018 and Beyond: Outlook and Turning Points,” March 2018.